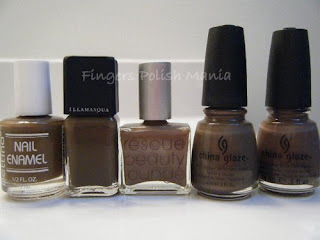 In the past, I have done dupe days, comparing polish colors and brands. 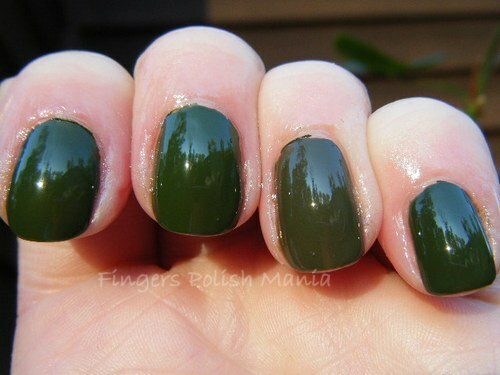 Yesterday I swatched 60 polishes and have put together seven posts containing these comparisons. These will be interspersed between my regular funky frenches. These also will not be as chatty as usual-just the down and dirty. Part one compares light browns and olive greens. First up, we have the light browns. Here is your bottle shot preview. We have Bettina #195, Illamasqua Taint, RBL Decorous, China Glaze Ingrid and China Glaze Street Chic. Here are the indoor and outdoor shots. Here you can see the rubber finish of the Illamasqua. The Bettina and Ingrid seem the same while Decorous is lighter and Street Chic has no shimmer. Next up, we have the Olive green family. Here is your bottle shot preview. 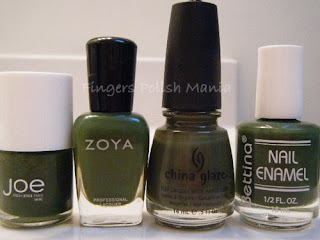 This is Joe Fresh Moss, Zoya Shawn, China Glaze Westside Warrior and Bettina Cheers. These seem all the same to me. The WW may be a little lighter. PS-anyone know where the first line of this post comes from?